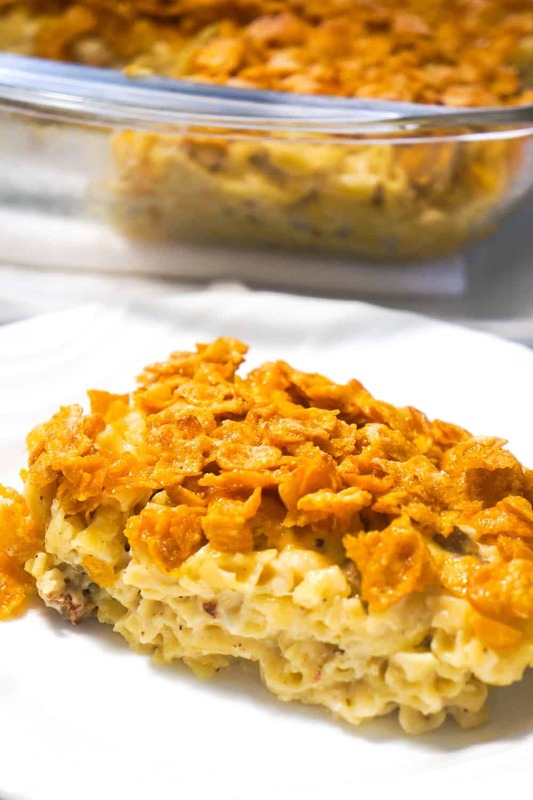 Breakfast Sausage Mac and Cheese topped with Frosted Flakes is a delicious brunch recipe with the perfect balance of savoury and sweet. 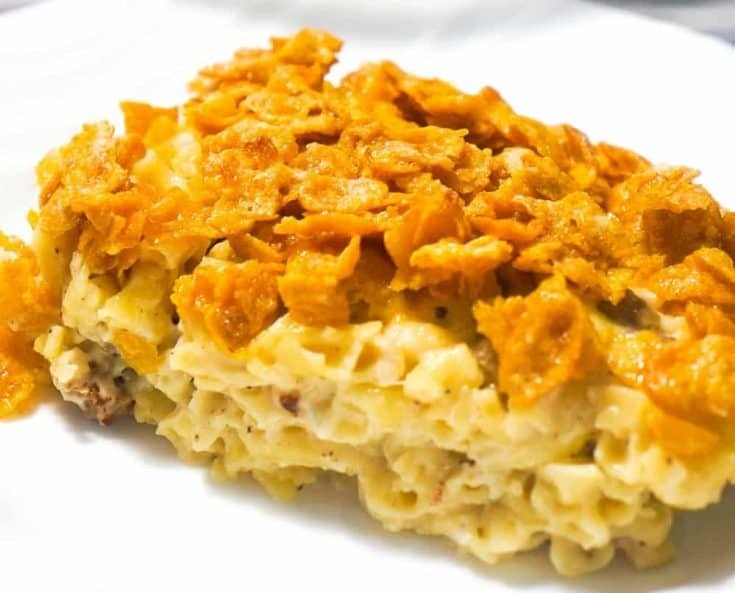 This homemade macaroni and cheese is loaded with Havarti cheese and chunks of maple breakfast sausages with a crispy coating of frosted flakes. 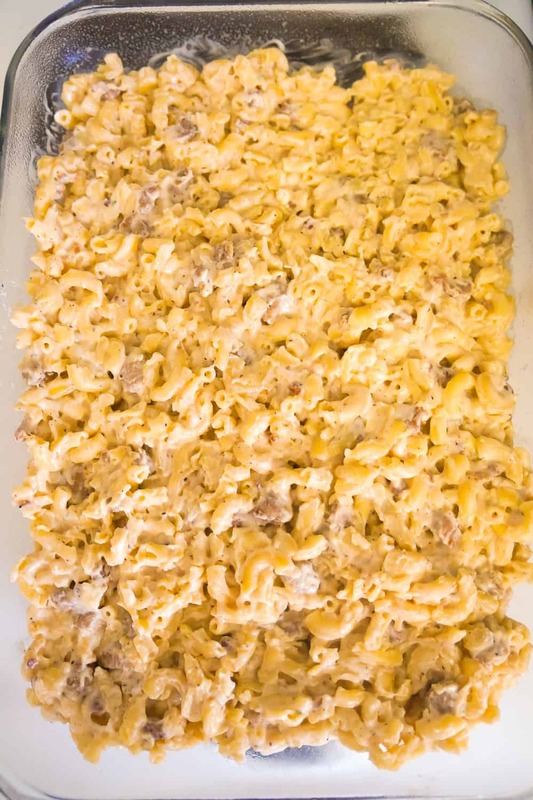 To make this mac and cheese breakfast casserole I started by cooking some macaroni. 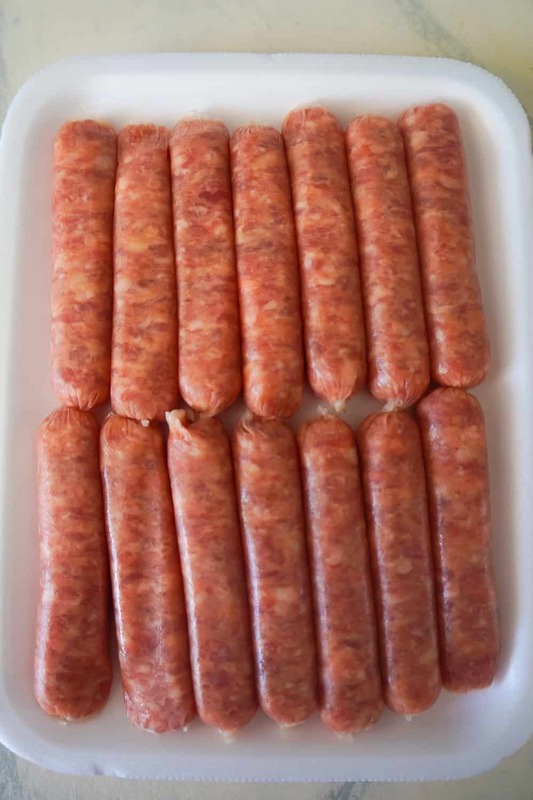 While the macaroni was cooking I took some maple flavoured breakfast sausages and squeezed all of the meat out of the casings. Then I cooked the sausage meat in a large pot until it was nicely browned. Once the meat was browned I added some flour and butter to the pot and let it cook for a few minutes. Then I stirred in some light cream and cooked it until the sauce started to thicken. I turned off the heat and added the cooked macaroni to the pot along with some shredded Havarti cheese and seasonings. I stirred the pasta until it was completely coated in sauce and the cheese was nicely melted. Then I dumped the macaroni into a greased 9 x 13 inch baking and spread it out evenly. In a medium mixing bowl I beat a couple of eggs with a fork. Then I added some frosted flakes to the eggs and stirred until all of the cereal was coated. I poured the frosted flake mixture over the pasta and spread it out evenly covering the entire top. Then I baked the casserole just until the frosted flakes were starting to brown around the edges. This delicious breakfast mac and cheese is a fun twist on a classic dish. This casserole would also be a perfect option when you feel like having breakfast for dinner. If you are looking for more breakfast ideas check out Maple Pancake Breakfast Casserole, Peanut Butter and Jelly Biscuit Bake and Monte Cristo Breakfast Casserole. 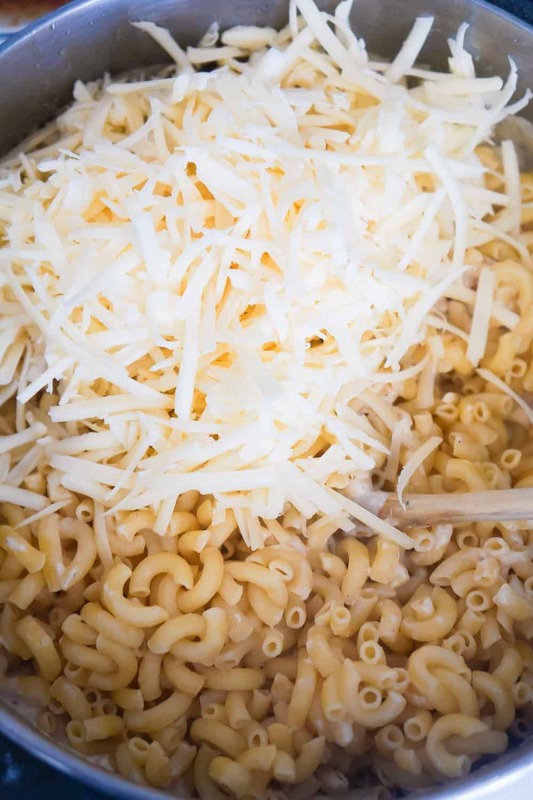 Another delicious mac and cheese recipe. 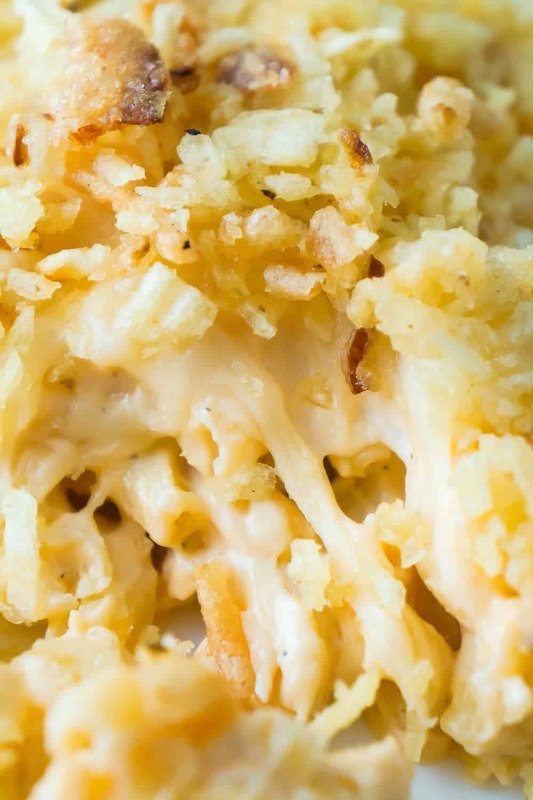 Check out this Easy Baked Mac and Cheese! Breakfast Sausage Mac and Cheese topped with Frosted Flakes is a delicious brunch recipe with the perfect balance of savoury and sweet. 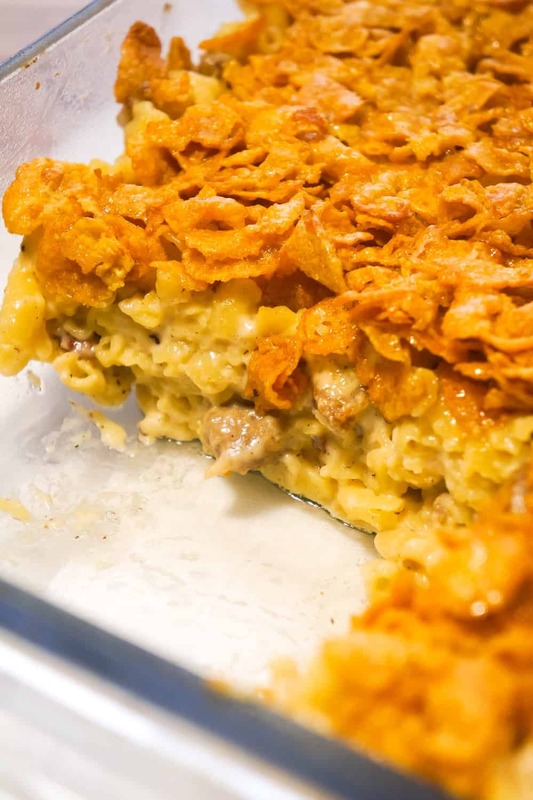 This homemade macaroni and cheese is loaded with Havarti cheese and chunks of maple breakfast sausages with a crispy coating of frosted flakes. Cook macaroni according to instructions on the package. While the macaroni is cooking squeeze all of the meat out of the sausage casings. 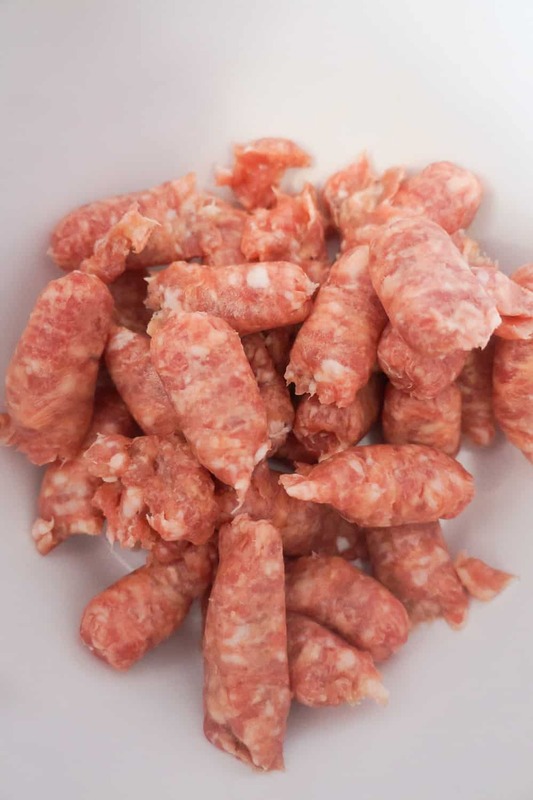 Add the sausage meat to a large pot along with a dab of butter or margarine. Cook the meat over medium-high heat until it is nicely browned. 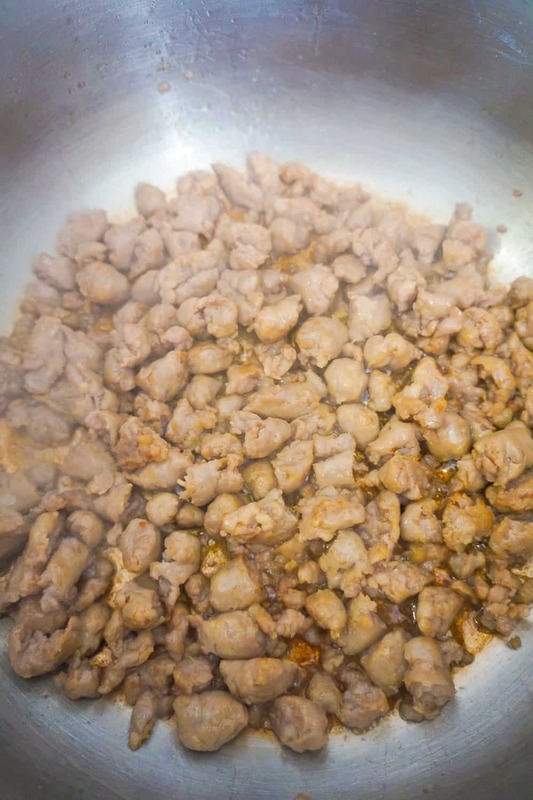 Add the flour and butter to the sausage meat and stir well. Allow it to cook for a few minutes stirring occasionally. 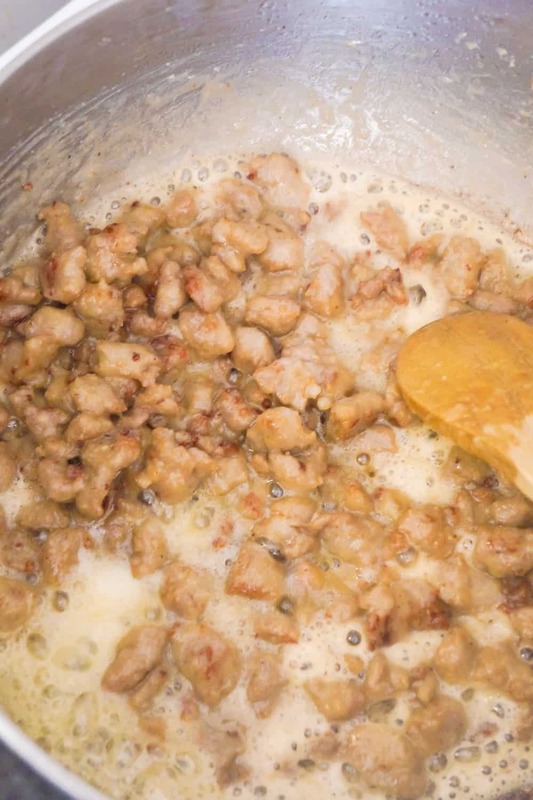 Add the cream to the meat mixture and stir well. 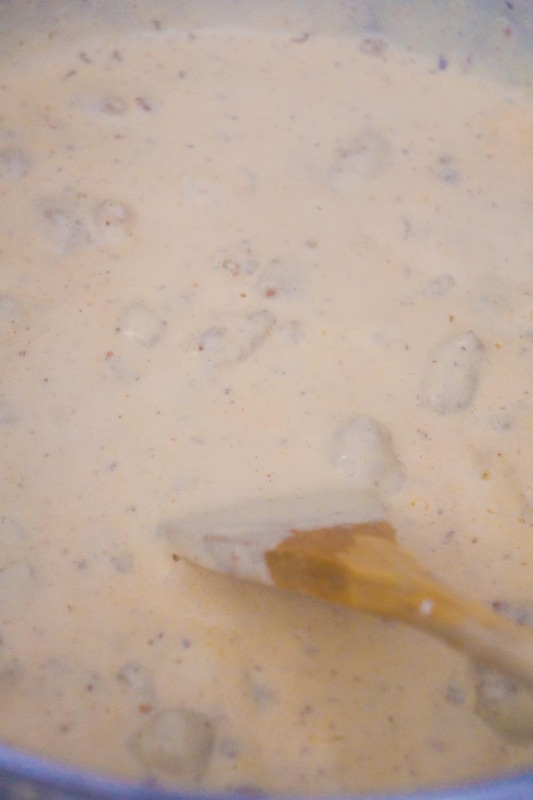 Continue cooking until the cream starts to bubble and thicken. Turn off heat. Add your cooked and drained macaroni to the sausage pot along with the shredded Havarti, salt, pepper and minced onion. Stir well until all the noodles are coated in sauce. Pour the macaroni into a greased 9 x 13 inch baking dish. 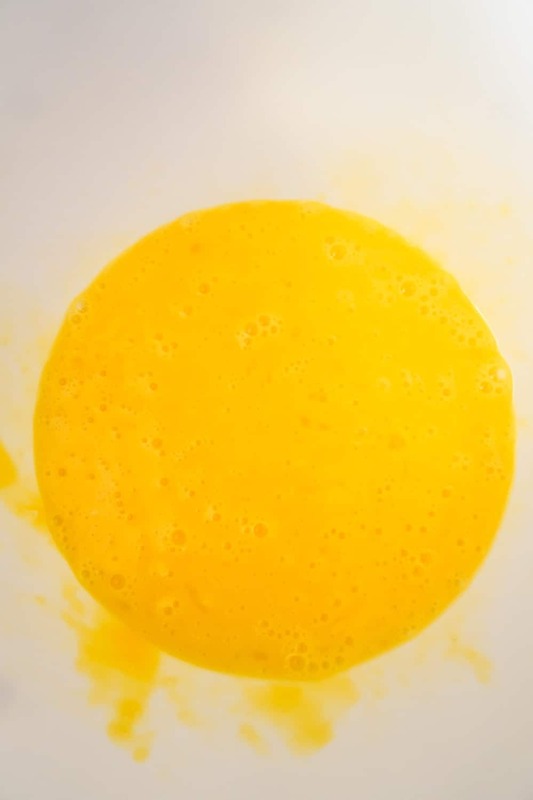 Crack two eggs into a medium mixing bowl and beat well with a fork. 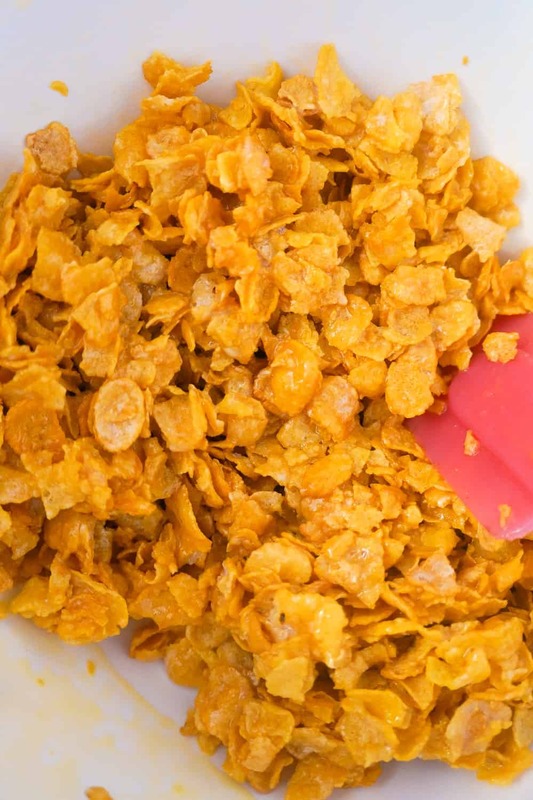 Pour the Frosted Flakes into the egg bowl and stir until all of the cereal is coated in egg. 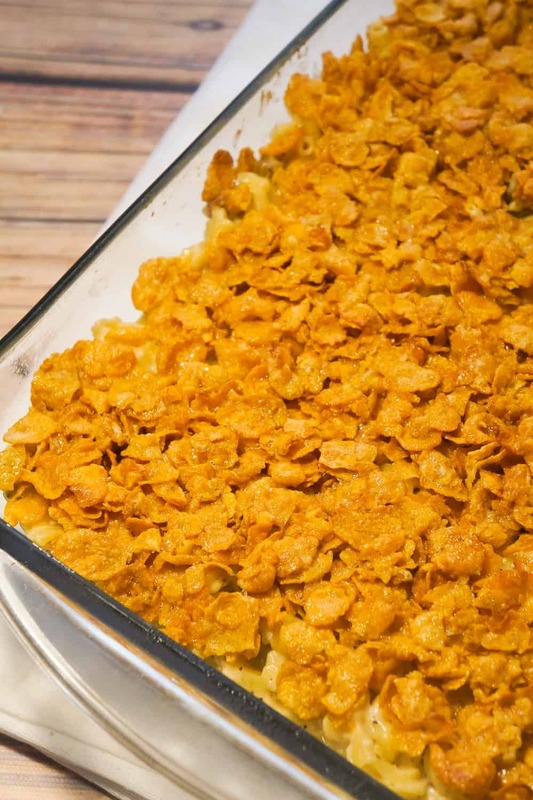 Dump the Frosted Flakes over the macaroni and spread out evenly covering the entire top. 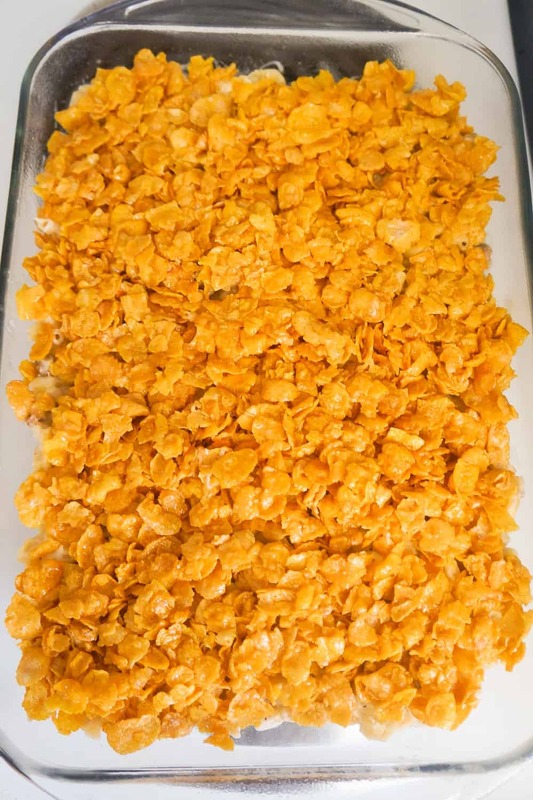 Place in the oven and bake until Frosted Flakes start to brown around the edges. 9-11 minutes.